Size is 15" x 25"
Size is 18" x 30"
Size is 24" x 40"
Who can forget the Hollywood film Top Gun? Though the movie put a young Tom Cruise on the map the real star of the show was the mighty F-14 Tomcat! The Grumman build fighter was the U.S. Navy's fleet defense fighter from 1975 until 2005. Being assigned to a Tomcat squadron was the dream of every Naval aviator during those years. Only the best were selected for Tomcats. 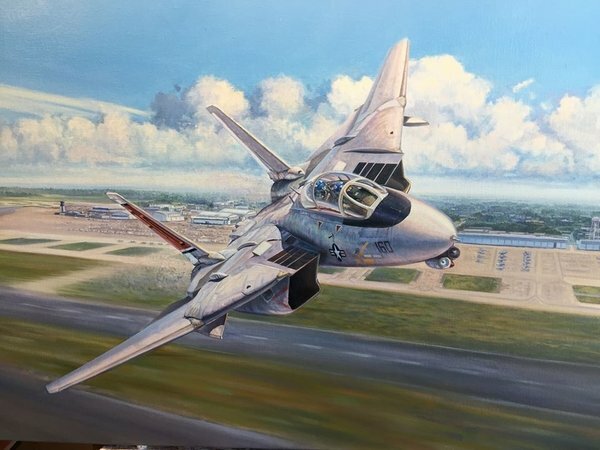 This painting depicts the final air show demonstration flown by an F-14 crew prior to the retirement of all Tomcats from Navy service in 2005. Last Demo, Baby was commissioned by Radar Intercept Officer (RIO) Joe ¡°Smokin¡± Ruzicka. Smokin who had the distinction of flying the final air demo with his pilot, Jack ¡°Rocco¡± Tangredi.